According to the Forbes report of The World’s Highest-Paid Athletes 2014: Behind the Numbers, top 100 highest paid sport personalities across the world earned a collective of $2.75 billion over a span of 1 year which was up by 5% compared to previous year. The report also mentioned that the rise in salaries of the players are on account of increasing TV rights which gives impetus to higher revenues across sports, as well the increase in prize money and a good endorsement income. 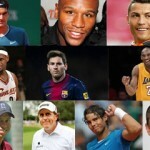 The highest paid sportsmen mainly are in basketball, football, soccer, tennis, cricket and few in track and field events. 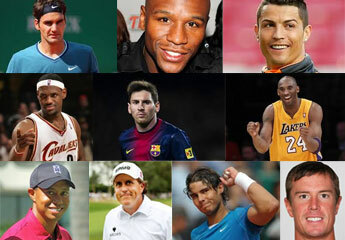 Following is the list of 10 highest earning sportsperson of 2014. Roger Federer – He is Swiss tennis player and ranks 2nd in the world as per the Association of Tennis Professionals. He also holds several world records and is nicknamed as Fed Express or Swiss Maestro. Federer started his career as a junior player and gradually rose to top winning several titles. Being one of the highest paid athletes in the world, his annual earning is around $135 million which comes from salary and endorsement. Federer earns a salary of around $83 million and he gains approximately $52 million from endorsement of reputed brands like Nike, Rolex, Lindt, Nationale Suisse, Mercedes-Benz, Gillette etc. He is also a brand ambassador for Emmi AG and Maurice Lacroix. Floyd Mayweather Jr. – An American professional boxer, he is currently undefeated as a professional and is five-division world champion. He has won 10 world titles. His total earning accounts to $105 million which entirely comes from his salary. Mayweather’s September 2013 fight against Canelo Alvarez had set a record for being highest pay-per-view gross ($150 million), live gate ($20 million) and total revenue (roughly $200 million). Cristiano Ronaldo – Portugal football player Ronaldo play as forward for Spanish club Real Madrid and is captain of Portugal national team. He became the most expensive player after he moved from Manchester United to Real Madrid in 2009. Under the contract with Real Madrid he is paid €21 million per year, making him the highest paid footballer in the world. His total wealth accounts to $80 million which includes $52 million salary and $28 million from endorsement this year. He is the spokesmodel for Emporio Armani men’s underwear and jeans. He has signed a contract with American sportswear company Nike until 2014 and also receives sponsorship from Coca-Cola, Castrol, Motorala, Jacob & Co., Fly Emirates and few others. LeBron Raymone James – He is an American professional basketball player. He plays for Cleveland Cavaliers of the National Basketball Association (NBA). LeBron has won two NBA championships, four NBA Most Valuable Player Awards, two Olympic gold medal and NBA scoring title. He was selected by Cleveland Cavalier in 2003 and since then there has seen no turning back. His total earning is around $72.3 million. He earns $19.3 million from salary and $53 million from endorsement owing to the sponsorship from brands like Nike, McDonald’s Coca-Cola, Upper Deck and others. He also earned considerable good amount through his small stake in Beats when it was sold to Apple. Lionel Messi – An Argentine professional player, Messi plays as a forward for Spanish club FC Barcelona and is captain of Argentina national team. He has received Ballon d’Or and FIFA World Player of the Year nominations. By the age of 24, Messi became Barcelona’s all-time top scorer in all official club competition. His estimated wealth is around $65 million. He earns $41.7 million from salary and $23 million from various endorsements. His major endorsement income comes from Adidas, Turkish Airlines and Samsung. Kobe Bryant – Kobe is an American professional basketball player who plays for Los Angeles Lakers of the National Basketball Association (NBA). He is winner of five NBA championships and has been ranked highly in this field. His total earning is $61.5 million of which $30.5 million comes from salary/prize and around $31 million from endorsements. He has gained a two-year contract extension of worth $48.5 million that will keep his on-court salary at top amongst NBA players. He earns good revenue from endorsement for Turkish Airlines, Lenovo, Nike and Panini. Tiger Woods – Woods is an American professional golfer and had been highest-paid athletes in the world for several years. He has broken numerous golf records. He was named as “Athlete of the Decade” by Associated Press in December 2009. His total earning is $61.2 million out of which salary contributes to $6.2 million and endorsement gets him around $55 million. His endorsement includes General Motors, Titleist, General Mills, and American Express etc. Philp Mickelson – He is an American professional golfer. He has won 42 events on the PGA Tour, including five major championship and three Masters Titles. He is one of 16 golfers in history to win at least three of the four professional majors. Mickelson’s total earning is $53.2 million with his salary accounting to $5.2 million and endorsement to $48 million. Major companies which endorse him are KPMG, ExxonMobil, Rolex, Barclays and Callaway Golf and Ford etc. Rafael Nadal – Nadal, a Spanish professional tennis player is currently ranked No.3 and is widely known as the finest clay court player ever played. He has won 14 Grand Slam single titles and 15 ATP World Tour 500 tournaments. His net wealth is $44.5 million and $14.5 million is from salary and winning while $30 million comes from endorsement. His biggest endorsement partner is Nike. Matt Ryan – Ryan is an American footballer, and plays as a quarterback for the Atlanta Falcon of the National Football League (NFL). He has several honors and championship to his credit. His net earnings is $43.8 million. His salary and winning accounts to around $42 million and endorsement to around $1.8 million. He has signed a five year contract worth $103.75 million contract with Falcons that includes $28 million signing bonus and $12 million option bonus paid in March.